NB: This will be the first post written in English, it's a little hard to me but I'll hope you'll understand all! If you'll find some mistakes please forgive me! Unfortunately I wasn't dead but school takes all my time and I'm always tired to write something or do work in progress of cosplay.. Finally spring is arrived and the weather is fine, this means it's time to do some shootings outside~ this week I have to do 2 differents shootings with two adorable girls, can't wait to do it! I'm a little bit anxious because I really want to do a good work and i feel like I'm not that good or that 'professional' photographer, but whatever, I'll keep trying to be a good photographer! And here's the little space for my cosplay work in progress! Today i went out to buy some fabrics, i wanted the yellow cotton but it wasn't in the shop so I bought some new fabric to begin a new version of Asuka for a future convention in this summer: Rimini comics. 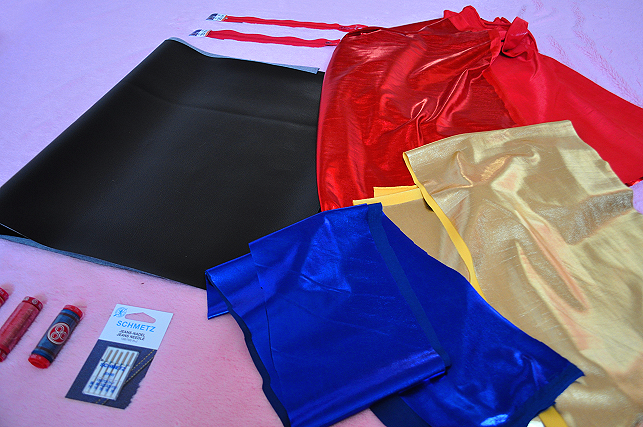 That's what i bought: red, gold and blue spandex, black leather, two zippers and the necessary for my sewing machine! 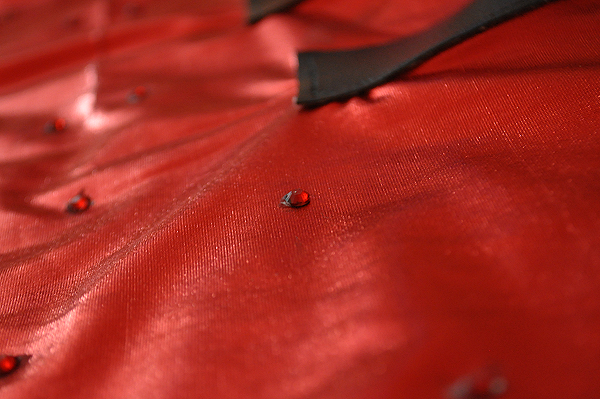 Can you recognize of which version of Asuka are these fabrics? 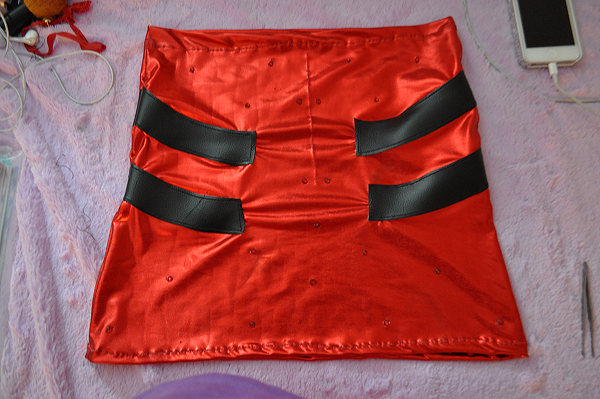 Aw, I'll keep it secret, you'll might recognize it seeing the next photos~ and that's what I made today: the skirt. 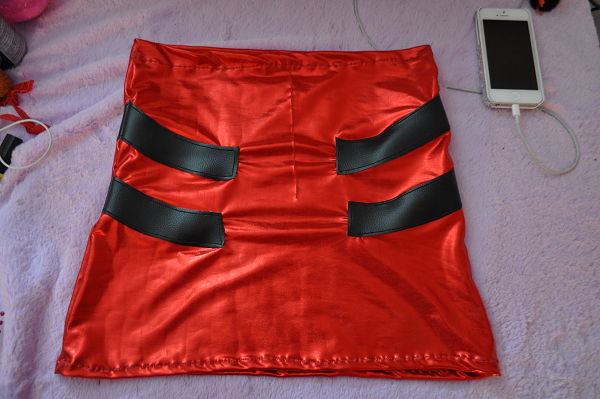 I made it a little too tight for me but It's a reason to lose more weight; the pattern wasn't very difficult and I made it in one hour, and i added more details like the cosplayer's skirt in the pictures on my pc! The next things I'll do will be the gloves and the collar and I'm going to end with creating the top. That's not a difficult cosplay (like the patterns, etc.) but in the details, i'm very perfectionist and I want everything to be perfect~ I wanna finish it early even if I've 3 months left, because i don't wanna get anxious. What you think of the skirt? Do you like it? 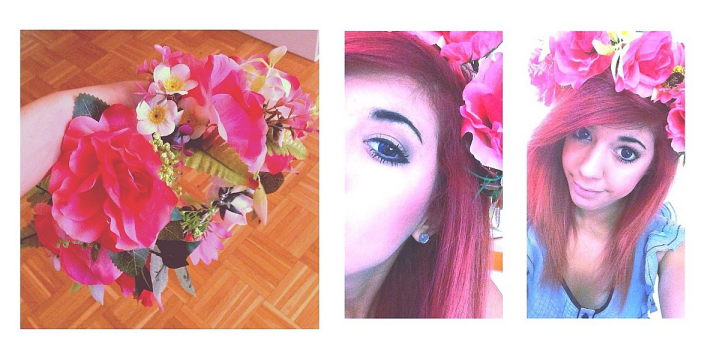 The next post about my make-up will be in IT, but it will be full of photos so it's ok! It's time to say goodbye readers, hope you'll have a good week and a perfect weekend! 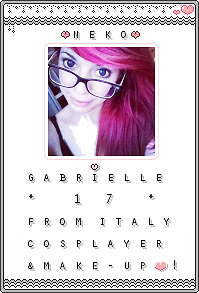 Mine will be perfectly awesome 'cause this wednesday i'll go to Milan to 'the Mosh Lives tour' with my boyfriend to celebrate our six months together just like when we first met at the Memphis May Fire concert, i'm so excited! Stay tuned for the next post, you won't be disappointed! Wow! Invidio un sacco la tua corona e il fatto che tu abbia una macchina da cucire, perchè ne vorrei terribilmente una anche io per imparare (come Rori Stark) a farmi almeno i cosplay più semplici. Un consiglio: il "filone inglese" che hai preso è un'idea molto bella; che ne dici di fare, invece che (per esempio) un post in inglese e uno in italiano, due post in lingua mista? Mi spiego: ho visto su altri blog dei blogger che scrivevano una manciata di righe in italiano, poi la traduzione in inglese e poi una o più foto, ripetendo l'operazione ogni volta che era necessario. Ho trovato questo metodo di lettura molto pratico sia per un italiano che per un inglese (così si evita di riscrivere tutto l'articolo e caricare le stesse foto due volte, che fanno diventare la pagina molto pesante).